This has anchored with me since, as Tony explained that “when you’re confused, you’re about to have a break through.” Well, I am happy to declare about myself, that Ladies and Gentleman… I’m confused. I recently experienced a situation where I witnessed the worst version of myself with a few close friends. I won’t go into detail, but have you ever had those times where you do something and then look back and think “what the hell was I thinking? !” – no alcohol required. In my very flawed human moment, I made others feel less than awesome because of something I hadn’t realized I needed to work through. It was embarrassing, humiliating, and pretty much sucked. After I had a few days to process what had happened, I apologized to my friends. Thankfully, they are forgiving as family and we are moving on. But the thoughts continue in my head to try and decipher what this experience is trying to teach me. I am confused by my behavior. I am confused about the reasons behind it. And also confused about how to move forward. But after some long-overdue quiet time this morning, I came to the resolution about one thing. Taking the time to think things through is critical to who we are. As we get older, so much of our identity is wrapped into our families, our jobs, our hobbies, our friends. It’s really easy to get lost amongst the noise and forget to reserve a piece of our identities for what feeds our creative souls. And when this gets out of balance – look out. That’s the point where helping others turns to resentment. Where a lack of contribution to what matters turns to bitterness. And it masks the sparkle we all have to exude. 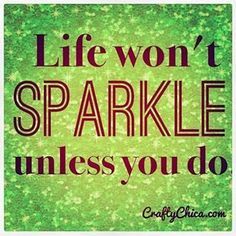 This sparkle is what makes us happy as humans, and attracts other “like” sparkle to it. I know I have a lot to still think about. But one thing’s for sure… confusion, mixed with gratitude and humility, has lead me to understand that it’s time for me to spit shine my sparkle.